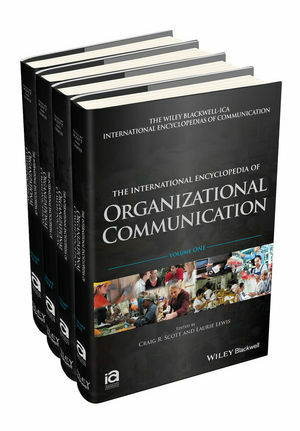 The International Encyclopedia of Organizational Communication offers a comprehensive collection of entries contributed by international experts on the origin, evolution, and current state of knowledge of all facets of contemporary organizational communication. Craig R. Scott is Professor in the Department of Communication at Rutgers, the State University of New Jersey, and Immediate-Past Chair of the Organizational Communication Division of the International Communication Association. He is the author of the award-winning Anonymous Agencies, Backstreet Businesses, and Covert Collectives: Rethinking Organizations in the 21st Century (2013), and edited a 2015 special issue of Management Communication Quarterly on hidden organizations. Laurie K. Lewis is Professor in the Department of Communication at Rutgers, the State University of New Jersey. Author of the award winning Organizational change: Creating Change through Strategic Communication (2011), Lewis is also Co-Planner for the Aspen Engaged Scholars Conference and former Chair of the Organizational Communication Division of the National Communication Association.